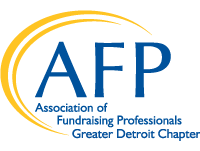 The AFP Greater Detroit Chapter holds monthly educational programs on a range of timely topics for fundraising and nonprofit professionals and volunteers. Each year, hundreds of chapter members and non-members attend these programs. As a Sponsor, you will link your company to our core mission of professional development for the benefit of our nonprofit community. *If committed to by the appropriate dates. AFP Connects is a quarterly networking event that allows for fundraising and nonprofit professionals to meet in a casual environment. These events not only allow attendees to get to know one another, but also allow non-members to learn more about AFP. The National Philanthropy Day dinner is the Chapter’s premier annual event, and this year celebrates 27 years of honoring outstanding contributions of philanthropists, distinguished volunteers, and those individuals active in nonprofits throughout the Southeastern Michigan community. We invite you to become a partner to recognize these individuals and organizations. Join over 700 like-minded community boosters, business leaders and colleagues to share in this annual event. Our Chapter’s monthly e-Newsletter is sent electronically to our growing list of more than 800 current and past members, volunteers and business partners. Send your company message to Chapter’s growing email list of more than 800 current/lapsed chapter members and business contacts. AFP Greater Detroit Chapter will send out message on your behalf. Please complete and return sponsorship form with payment to secure your yearly chapter sponsorship. or contact Rebecca Hepner at (248) 892-6355 or rebecca_hepner@usc.salvationarmy.org.